Join our team - the largest regional network of primary and specialty care providers in southern New Hampshire anchored by a leading MAGNET® and CMS 4-star rated Medical Center. This video takes a look back on the changes SNHH has gone through over time. We are always growing, and we’re proud of how our facilities, technology and wonderful employees have developed over the years to better serve our community. Nurses share their thoughts on why it’s great to work for Southern New Hampshire Health. Working with us means getting the opportunity to grow your career, stay involved and improve patient outcomes throughout the community, all under the roof of a forward-thinking health system. Southern New Hampshire Health has been recognized as one of the ``Best Companies to Work For`` in 2018 by Business NH Magazine! Southern New Hampshire Medical Center was recently Recognized as a ‘High Performing Hospital’ for Heart Failure by the U.S. News & World Report. The U.S. News analysis of hospitals includes data from nearly 5,000 centers across multiple medical specialties, procedures and medical conditions. NASHUA, NH — Nashua is the safest city in America. That is according to WalletHub, a personal finance service which on Monday released its “2017 Safest Cities in America” survey. Nashua was one of five New England cities to make the top 10. The survey was based on crime, road quality and unemployment, among other factors. Manchester was ranked No. 28. Southern New Hampshire Medical Center has been recognized by the American Nurses Credentialing Center Magnet Recognition Program® for excellence in nursing. This credential is the highest honor a hospital can receive in nursing. Magnet organizations must show that their nursing outcomes are better than national benchmarks in several areas, including: patient falls, hospital acquired pressure ulcers, and health care acquired infections. Magnet organizations must also exceed national benchmarks for patient and family satisfaction, as well as nurse satisfaction. Southern New Hampshire Health has been selected by the readers of Parenting New Hampshire as a “Family Favorite” award recipient for the categories of: Favorite Greater Nashua Hospital, Favorite Immediate Care Center and Favorite Birthing Center. Southern New Hampshire Medical Center - a premier medical center that is Massachusetts General Hospital's only clinical affiliate in the region. Today is National Administrative Professionals' Day! 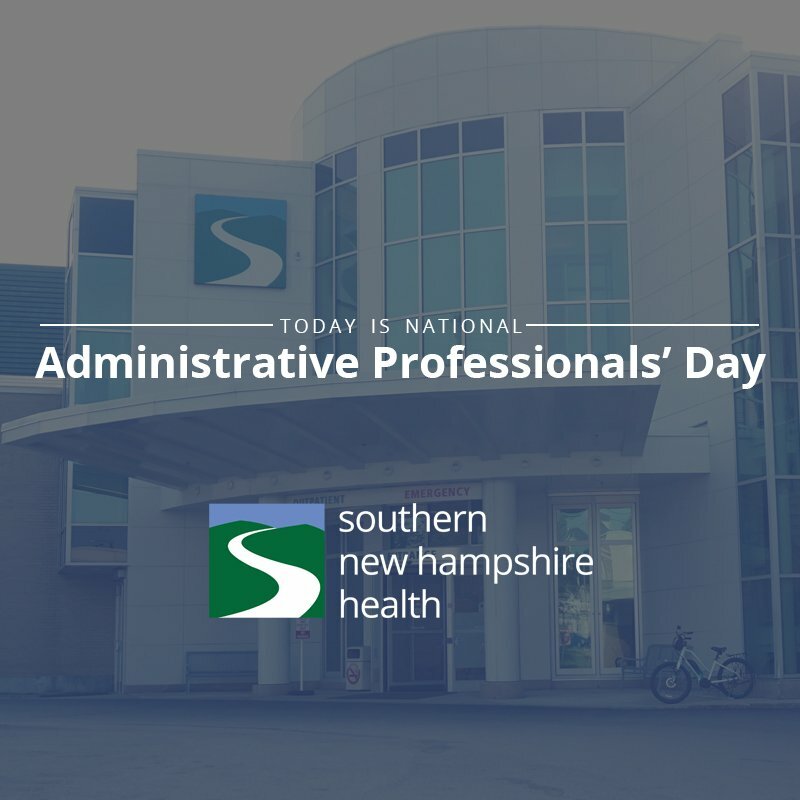 Thank you to all the administrative professionals at SNHH for your dedication to our mission and our community!!! New Hampshire is one of 19 states who have reported cases of measles this year. The CDC recommends that every individual over the age of one receive two doses of the measles vaccine, separated by one month. Have you been spring cleaning lately? Or maybe you're a fan of Marie Kondo and want to tidy up? We're collecting items for our patients at the Behavioral Health Unit. We are looking for jigsaw puzzles, craft supplies, and PG/PG-13 videos. Bring your items to the Donation Box outside the Medical Center Cafeteria or to our West Campus location! We're showcasing the Walls of Hope Employee Artists! Get to know Robyn, Acute Case Manager, Patient and Family Services. Learn about Robyn's inspiration and more in our artist spotlight! @solutionhealth Hello we are a health system located in the United States and are wondering if you are still currently using your solutionhealth twitter handle? If not we would like to discuss the possibility of acquiring it. Thank you for your time! Follow our social media properties and stay up to date with our most current career offerings, opportunities, events, news and all of the goings-on around our facilities. We want to keep the conversation going with you! Connect with us and our growing community today! Consistently ranked one of the best places to live in America, southern New Hampshire is an economically strong region with a low cost of living, including no state sales or income tax, outstanding schools, and safe and vibrant communities to raise a family. At Southern New Hampshire Health, as an employee you are a valued member of a team that makes a higher level of care happen every day. We believe that you deserve the most affordable and comprehensive benefits we can provide, and we continue to work to obtain those by offering great benefits to our employees. Get the professional support necessary to succeed. Our goal is to keep employees learning and achieving throughout their career. To support this, numerous development opportunities are available to staff. To get you off to a great start, all employees are welcomed and introduced to the Health System with a full-day orientation program. Full-time and part-time employees can qualify for yearly tuition reimbursement so they can further continue their education while working in their field. We work closely with local colleges and universities to benefit our continuing education employees by making their schooling more affordable. Many live and on-line courses are available for both employee and leadership development topics. We also provide wellness workshops to help keep you healthy. I’ve worked at SNHH for the past six month, and I’ve noticed that teamwork is really important here. When I was first learning how to do rounds, I started falling behind, and a co-worker helped me out, so I could catch up. This made me feel like I was really working with a team. At my last job, I had to fend for myself, but my experiences here have made this job rewarding for me. Everyone is on the same page. I also try to help others when they need it. There are times when I help a co-worker with trash and cardboard removal when my co-worker needs more time for extra mopping in an area that needs it. The help makes a big difference. I really appreciate compliments from other departments too. Recently, I received them from ED nurses, lab technicians and Security officers. They noticed my hard work, and I really appreciate it. Since returning to Foundation Medical Partners, I’ve never looked back, and I plan to retire at Amherst Family Practice. As an employee, I’ve experienced exceptional career growth. I’m treated with respect, my contributions are acknowledged and appreciated, and I have had the opportunity to mentor new employees. Our CEO of Foundation Medical Partners is very approachable and comes to our site meetings to thank each and every one of us for our dedication. Everywhere I go, I seem to run into someone who wants to share a personal experience with me. One afternoon at the grocery store, a woman next to me started a conversation. As we talked, I realized we had a lot in common. It was like running into an old friend. During our chat, she mentioned that she’d recently changed doctors and said she was so impressed by the care she received from the moment she walked in the building. She said the receptionists were kind, cheerful and helpful, and the nurses were exceptional and made her feel right at home. She also mentioned how caring, kind and knowledgeable her new doctor was. When I asked which practice she was going to, she said, “Amherst Family Practice!” My heart felt so warm, and I was so proud to inform her that I work at this amazing practice. It is truly a pleasure to be a member of the Southern New Hampshire Health team! I have worked at Foundation Gastroenterology for a little over a year, and I couldn’t be happier! This practice is like a family to me, and I look forward to coming to work every day. Since I started, the direction, support and communication I’ve received has been wonderful. No one sat me at a desk expecting me to know how to do everything. Instead, I received mentoring from the beginning, and I’ve been encouraged to pursue additional educational opportunities along the way. This practice is always striving for the best, and respect and trust are really important here. Our providers ask me to take care of things for them, and they appreciate my work and know they can count on me to provide excellent patient care. It’s really rewarding. As an organization, my colleagues are always looking for ways to help patients and each other. It seems like every time I walk down the hallway, there is a doctor or nurse or staff member giving directions or asking if they can help. This care for others really makes me feel at home. Ever since I started in this role five years ago, I’ve been given opportunities to influence care delivery in positive ways from Day One. Foundation Nursing Leadership is always seeking employees who have ideas to share and a strong commitment to patient safety. The ideas I contribute are always taken seriously. I feel valued and appreciated, which is very important to me. Our department also has an exceptional orientation process. We’re really committed to empowering new nurses by providing support, resources and coaching, which leads to success. In one instance, I visited the department of a nurse who received orientation training from me eight months prior. She called me over to her desk and said, “I need to show you all of the things I’m doing now!” It’s really rewarding to help employees grow into their role, as they provide the best patient care. I’ve worked as a nurse at SNHH for five years total, spending the past year as a nurse in Pre-Op/PACU. I’ve really appreciated the fact that I can learn from other nurses who have been here for 20 or 30 years who have previous experience in departments like the ICU and Orthopedics. We share a well-balanced collaboration of minds from different perspectives. Teamwork is also really valued here. We pitch in and help each other whenever we can. During one of my shifts, I needed to stay with a patient while the patient received continued care in Radiology. This patient really needed support, because family and friends weren’t in the area. While I was away from my department, my whole team was there to take care of everything without being asked. During this time, I was able to connect with the patient, providing reassurance that the patient wasn’t alone; we would get through this together. Situations like this are the reason I became a nurse in the first place. Working with a great team while showing patients respect and compassion without judgment is really rewarding to me. I’ve worked at SNHH for the past three years, and during this time, I’ve appreciated the fact that my manager organizes monthly community service projects and activities. Some of them include volunteering to help kids do their homework through a Nashua Police Athletic League program or helping out at the Nashua Soup Kitchen. My manager also plans recognition activities to engage with us and show us that we’re valued. During these activities, comment cards from co-workers and patients are shared. The positive feedback we receive boosts our self-esteem within our department and the hospital. Once, I was given an SNHH lunchbox as a token of appreciation for a comment I received on a card. It’s great when we’re reminded of the great job we’re doing. I have a great team! There’s nothing more satisfying than knowing you’ve made a difference in the life of another. Come work for a system that gives you the resources to excel at and be happy with your job, knowing that it will impact the community in a great way.